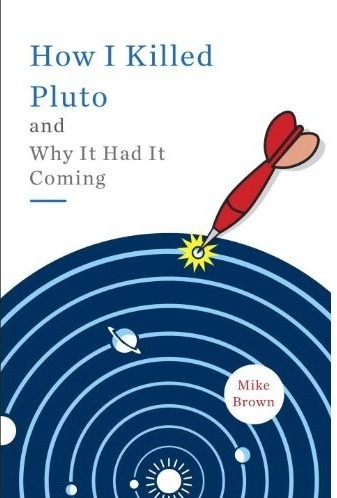 Mike Brown's Planets: How big is Pluto, anyway? These days, a question like that is easy to answer: type it in to Google, click on the Wikipeadia entry, and read the answer: 2306 +/- 20 km. The +/- (to be read “plus or minus”) is important here: every measurement has limitations and an often critical part of science is correctly quantifying those limit. The correct interpretation of 2306 +/- 20 km is that 2306 km is the most likely value, but, within a certain range of probability, the value could be as low as 2286 or as high as 2326 km. The value could still be higher or lower, but the probability is small. Even I was caught off guard by this one. I heard the report about Eris now being smaller than Pluto early on a Sunday morning after a week of travel, and I was too groggily jet-lagged to have looked closely at the numbers (indeed, since the results of the occultation have not yet been fully analyzed or published it is hard to even find the numbers). I just thought “wow; Eris smaller than Pluto? This is not what I would have guessed,” and I moved on to try to understand what this new bit of information about Eris was telling us. With a little more time to examine, though, I have to say: there is something fishy in the size of Pluto. If you scour the internet, you can find authoritative sources claiming that Pluto is anywhere from about 2200 km to 2400 km in size. Some official looking list of solar system body sizes at JPL claim 2280 km. The article from Sky & Telescope first suggesting Pluto is larger than Eris says that Pluto has an “accepted” diameter of 2344+/-20 km. Wikipeadia, again, 2306 +/- 20 km. Why such confusion? Because, perhaps shockingly, scientists themselves have not settled on a consistent answer. In scientific papers describing a 1988 occultation of a star by Pluto, Bob Millis and colleagues suggest a size as high as 2390 +/- 10 km. In earlier papers, Eliot Young and Marc Buie each used measurements of the time it took Charon to cross the face of Pluto to derive much smaller Pluto sizes of 2284 +/- 18 km and 2300 +/- 14 km, respectively. The measurements span a range of about 100 km, but the uncertainties in the measurements are always alleged to be smaller than 20 km. Clearly some of the measurements or the uncertainties or perhaps both are in error. These discrepancies have been known for years, and astronomers have suggested that Pluto’s atmosphere is to blame. Pluto’s atmosphere, like the earth’s, is primarily made of nitrogen. On Pluto, however, the next most abundant component is methane. Methane, like other hydrocarbons, decomposes in sunlight and eventually turns into increasingly more complex molecules. Hydrocarbons that are released from the surface of Pluto and go into the atmosphere suffer the same ultimate fate as hydrocarbons that are emitted from a car tailpipe and go into the skies of Los Angeles: they become haze. When measuring the size of Pluto with a stellar occultation, an opaque haze layer 10 or 20 or 30 km thick will cause Pluto to look 10 or 20 or 30 km bigger. (An alternative suggestion is that a warm layer at the very bottom of Pluto’s atmosphere causes a shimmy mirage which makes Pluto look bigger). When Bob Millis suggested a size of 2390+/-10 km, he specifically said if there is no haze in the atmosphere. When, alternatively, analyzing the data assuming that a haze is present, he could only state that the diameter of Pluto+haze is around 2360 km. Pluto must be smaller than this, but by an unknown amount. The stellar occulation size now is at least consistent, in principle, with the smaller measurements from timing of Charon, but these measurement, too, have potential problems. 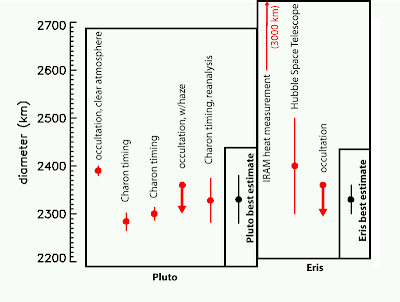 In a later analysis (after seeing the larger sizes coming from stellar occultations) Eliot Young reanalyzed his own data and realized that some of the simplifying assumptions made in their earlier analysis made the derived size of Pluto both smaller and seemingly more precise than it might actually be. When he dropped those perhaps simplistic assumptions, he came up with a slightly larger size (and larger uncertainty) of 2328 +/- 46 km. So what is the actual size of Pluto? As a scientist you don’t get an answer key. You have to look at all of the measurements, read the scientific papers, and try to understand the discrepancies. Sometimes you simply might have more faith in one type of measurement than another. Sometimes you trust certain scientists more than others. Sometimes you simply don’t know and you decide that the true answer could be anywhere with the range of the measurements and you carry in your mind a larger uncertainty that any of those you see written in a paper. In the case of Pluto, my first instinct would be to go with a stellar occultation. These are the gold standard in precise size measurement, at least for a body with no atmosphere. But the atmosphere of Pluto and the potential contamination with haze makes me wary of using the stellar occultations as anything other than an upper limit. The two separate Charon timing experiments come up with precise and consistent answers – which is always encouraging to see -- but these are complicated analyses with multiple assumptions, so I am again a bit wary. When I look at all of the evidence I am most swayed by the reanalysis from Eliot Young, who made the minimal number of assumptions. The uncertainty that he derives is larger than the other methods, but that uncertainty seems much closer to the mental uncertainty that I get from reading the discrepant results here. Interestingly, the timing experiments also give a size of Charon, too. The reanalysis from Eliot Young suggests a diameter of 1256 +/- 42 km. Recently, though, a much better measurement from an occultation has shown that the true size of Charon to be 1209 +/- 3 km (and Charon has no pesky atmosphere to cause problems), so perhaps the mutual events are systematically overestimating the sizes of Charon and of Pluto, also, and the true size is indeed on the smaller end like the initial analyses suggested. What to do? When faced with discrepant data and no obvious reason to prefer one over another, the most important thing for a scientist to do is to make it clear just how uncertain the real answer is. So, from now on, if you ask me, I will tell you Pluto is probably 2330 +/- 50 km (I round the numbers, since at this level of uncertainty a few kilometers here or there don’t matter). The upper end is set by the stellar occultation. The lower end corresponds approximately to the initial timing experiment analyses, and the middle is the Young reanalysis. 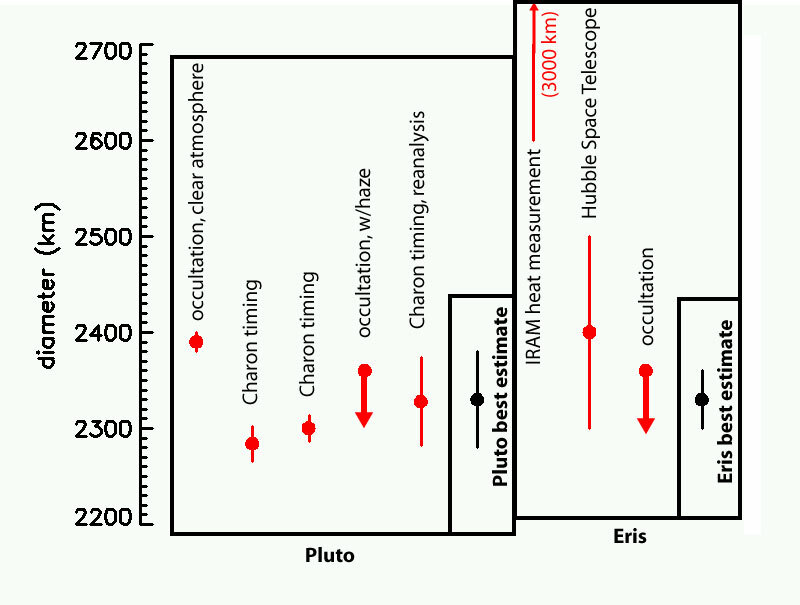 Estimates of the sizes of Pluto and of Eris. Different methods give different results for each body, but combining the different results with a best judgment of the reliability of each can be used to come up with a best estimate for each body. At about the same time, I had taken pictures of Eris (then still 2003 UB313) with the Hubble Space Telescope, and I could immediately tell that Eris was definitely not on the large end of their suggested range. Careful analysis of the barely-detected disk of Eris finally suggested a size of only 2400 +/- 100 km. Like the case for the multiple measurements of the size of Pluto, the two measurements for the size of Eris did not agree. But both the Hubble and IRAM measurements were difficult with the potential for error. I was willing to believe that each of us had underestimated our uncertainties a bit and that the true size of Eris was something like 2550 km, a little bigger than our Hubble measurement suggested, and a little smaller than IRAM. As I detailed earlier, assuming this diameter meant that Pluto and Eris had the same density, which seemed perfectly reasonable. The new occultation measurement suggests that Eris is no larger than 2360 km, which has been called “substantially smaller than expected.” But, of course, that size is well within the range of expectation from my Hubble Space Telescope measurements, it is just that it is far outside the range of the IRAM measurement. We are left with no choice but the discard the IRAM measurements at this point, I believe. Until the full analysis of the occultation results is complete and published the best we can do is to try to combine the HST and occultation results. Because of the Hubble results, it would not surprise me at all if the measurement eventually suggest Eris were as small as 2300 km, but I will be surprised if it is any smaller than that. From this unrigorous analysis I come up with a current best guess of something like 2330 +/- 30 km. Fear not, a real winner will be declared eventually. The faint star that Eris occultated was only viewed by 3 small telescopes. With a brighter star or more and larger telescopes the size of Eris will eventually be measured with shocking precision. As an example, the size of Pluto’s moon Charon, which has no atmosphere, is known to an uncertainty of 3 km! We should be able to eventually do as well with Eris. For Pluto we only need wait 5 years. The New Horizons spacecraft, though whizzing by Pluto at an incredible speed, will get close enough and take accurate enough pictures that – haze or no haze – a highly accurate size will also be measured. Scientifically, knowing which one is bigger will teach us…. absolutely nothing. The fact that they are nearly identical in size is scientifically interesting; which one is a few kilometers bigger than the other matters not one bit. But, still, I will admit to having a bit of an emotional attachment to Eris, so, deep down inside, I want to believe it will turn out to be a little bigger. But I, like every other scientist on the planet, have absolutely no way to know which one will turn out the biggest. Hey, bigger ain't always better ;) But I'm holding out hope for ya that Eris comes through. Five years seems like such a long time to wait for confirmation on Pluto, but then again, the anticipation of finally being able to ogle the actual surface details (OMG!) makes it all worth the wait. Anyway, great explanation of the existing uncertainties. Eris is a quarter more massive than Pluto... That we know for sure since both of these TNO:s have satellites. So we may still say that Eris is largest TNO even tough Pluto would have a bit larger diameter. Similar kind of situation is in the case of Vesta and Pallas. They are almost identical in size. Pallas is a bit larger and Vesta is more massive. So which one is the largest MBA, Vesta or Pallas? Ofcourse we have better information about Pallas and Vesta than we have about any of the TNO:s since Main-belt asteroids lie much closer to the Earth than the TNO:s.
Do we know for sure that the occultation results for Eris absolutely cannot permit it to be bigger than 2360km? Anyway, my bet's on Eris, because it's more massive than Pluto and because you don't want to annoy the goddess of strife. P-V: The occultation results are purely based on rumor these days, so we don't know ANYTHING for sure. Nice write up! Go uncertainty! There's always uncertainty, all "Lab rats" know that. For the real size of Pluto, let's blame it on the haze and hope that New Horizons will see a KBO with lots of haze. I gotta agree with Run here. If I handed you a styrofoam 1-meter in diameter that weighed almost nothing and a bowling ball and I asked which is bigger I think everyone would answer that the (much) less massive styrofoam were, nonetheless, the bigger one. Travis: The occultation like years rather than months, unfortunately. Currently unknown. But **probably** before New Horizons gets there. I get mass and density confused. One of these days I'll master the definitions. Did the last occultation exclude a hazy atmosphere for Eris? Or did the IR experiment also give a blackbody curve too cold to vaporize anything? I'm betting Eris is larger. Seems like the fact that Eris is so much further away, yet still detectable, makes for a good bet that its on the larger end of the range. If Eris is so much denser and so much brighter, then what is going on there to make it so bright? Cryovolcanism? The place gets more interesting, the more we know about it. BTW its surface gravity is half the Moon's. Size matters where it concerns out ability to make visual observations, while mass matters in the way by which these bodies might affect their neighbors during a close passage. The KBOs and TNOs do not approach each other particularly often--in human terms, practically never, so I think we should give greater creedance to size (cross-measure). Without physical size, therefore reflective surface areas, we might never have seen these for decades or centuries to come. In the same manner, we have Sedna in our midst, relatively speaking, since it is fairly near perihelion. I have to wonder if there might be much larger such highly elliptical orbiting KBOs out there, but circuiting the sun hundreds of AU away and escaping our notice. "More massive" intuitively seems to me like a more useful classifier than "Larger", if you want to think like a dynamicist. If you look at the variations across the entire Solar System (or even the Kuiper Belt), a 25% mass difference looks like chump change. But both measurements lead us to the density difference, which is far more interesting (to me, anyway) Why should Pluto and Eris be such different places? "More massive" seems to me to be a more useful way to compare Eris to Pluto than simply "Larger", especially if you think like a Dynamicist. But in the big picture, even 25% seems like chump change. And somewhow, I don't think either Pluto or Eris really cares who gets to be Top Dog of the Kuiper Belt... What I'm far more curious about is the density issue Mike talked about earlier. Why should Eris and Pluto be such different places, even if they are about the same size? I found out that the team at Spaceobs doing one of the observations was only 20 meters from one of the other teams, lead by Jose Luis Ortiz. This is important because we cannot use these occultations to distinguish between a spherical and ellipsoidal shape for Eris. 20 meters is way, way, way inside the error bars. Effectively there are only two chords instead of three. But we do get to check the instruments used against each other. The spaceobs team remarked that for Eris to be smaller that Pluto it would have to be "whiter than white", IOW have an albedo exceeding 100%. The thermal measurements you mentioned (Spitzer's also done thermal measurements IIRC) show that Eris has a larger surface area than the occultation results would imply, so at this point I'm pretty confident that Eris is an ellipsoid, but what it's eccentricity is I don't know. We were unlucky enough to catch the short axis. Eris has obviously been involved in some kind of collision whether you think it's an icy ellipsoid or a pure-rock sphere. I'll go with the ellipsoid. There has to be SOME explanation for the thermal measurements. mikeemmert: I don't buy it. A lot of what has happened, as I detail here, is not that Eris is smaller than thought, but that Pluto is suddenly being declared bigger. Which is odd. But even for a size of 2300 km Eris only needs to have an albedo of 93%. High, but not >100%. Why would it have such a high albdeo? My guess is that its atmosphere is plated out as frost on the surface, so it is super reflective. I think that makes more sense than being elliptical! But you're right about there really being only 2 measurements across the face. Pluto is being declared bigger because some people want it declared a planet again. I think that's because of the terrible fight to get New Horizons funded which makes these people think it might be de-funded. Well, the ship's on the way. I don't think anybody in his right mind would want to hit the "off" button at this point. I wish I could think of some way of reassuring these people that New Horizons is safe. I can, in fact, think of arguments why Eris isn't an ellipsoid but I'd rather hear it from you. Eris' surface probably IS frost, meaning it's uniform in color and brightness. And I know you and some other people have tried to find a light curve and cannot, OK, I accept this as observational evidence. But I think it rotates pole-on because of the thermal measurements. The higher the albedo, the harder the thermal measurements are to explain. I have a question about Eris' occultation. Because it's so incredibly far away, it must be travelling at a fantastically slow speed around the Sun, whereas Earth is whizzing around once a year (at a speed of 30km/s I believe). So when it is said that Eris has "passed in front of a star", is that primarily because Eris is moving relative to us or because we're moving relative to Eris? I suspect the latter, but does Eris have an appreciable enough speed to complicate the calculations? I'd love to see a blog post on this even if it gets a bit mathematical. When's the book tour coming to LA? "When measuring the size of Pluto with a stellar occultation, an opaque haze layer 10 or 20 or 30 km thick will cause Pluto to look 10 or 20 or 30 km bigger." Seems to me that since the haze will be on both sides of the planet, then a haze layer of 10 or 20 or 30 km thick will cause Pluto to look 20 or 40 or 60 km bigger? Anyway, as always, endlessly fascinating! As far as I am concerned the best estimates for Pluto's diameter is the one determined by E. Lellouch et al. using IR observations at the VLT to understand better the structure of the atmosphere of Pluto, and reanalyzing the occultations he obtains a radius between 1169 and 1172. We are quite far from the error bar of 50km you give. As you said New Horizon hopefully will give a "final" value, but if the author felt confident to give a radius within 3 km, your guess at 50 is certainly wrong. Eris's speed (if I remember correctly) during the occultation we observed was 26km per second. I feel confident we have determined the occultation parameters to "slightly" better than a second. The letter to Nature will be submitted relatively soon now, but your estimate of Eris is wrong, our measurements give clearly a small diameter to Eris. Not much, no big deal anyway, you are basically right, there are (so far) two Plutos out there, the biggest asteroids of the solar system, but I can tell you yours is smaller than the original one :). Oh sorry, yes, I was familiar with that one. They don't put a 3km error on the radius, they put 3 km error bar on the **lower limit assuming a clear atmosphere**. I still am curious why the stellar occultation and mutual event observations give different answers. Still seems to me that a natural answer would be hazes, which Lellouch didn't consider. Really, I promise, I am not being obstinate here, I just want to know what the real answer is and I don't think we have an accurate way to gauge that yet! Truly looking forward to the paper on Eris, though. I've only heard Bruno's comments, not seen the real results. Those will be super awesome. OK, after Jose Ortiz (finally established communication!) asked me about the ellipsoidal shape, I decided to go directly from original observations and think completely independently. Here in Figure 1, we see the shape of Dysnomia's orbit. I couldn't find the original stacked superimposed photo, but I do remember it looking exactly like the drawing. I measured the elipse of Dysnomia's orbit, and on the screen scale I was using it measured 61mm x 89mm. If we divide the short axis by the long axis, we get the sine of the angle by which Dysnomia's orbit is tilted with respect to the observer, arcsin 61/89)~ 43 degrees. Assuming (this is a dangerous assumption) that Eris spins on it's axis in the same plane Dysnomia orbits then it's a little less than pole-on. The permanently illuminated (over a short period) patch of Eris that will not vary would be the sine of 43 degrees, 61/89, squared. It turns out that about 47% of the dwarf planet is in sunlight all the time so this will give the same lightcurve. The rest of the lightcurve will vary according to shape or local albedo. That's a significant percentage which should show up in observations, but doesn't. So, Eris should be pretty much spherical within the error bar of the lightcurve observations. Not squaring the sine was what resulted in me sticking my foot in my mouth. Hmm, embarrassing. No need to bet. It is now known to all but the most obtuse that, given Sicardy's date, Pluto is larger than Eris. @Anon: Nope, Sicardy's data are only on Eris; he didn't measure Pluto. The big question now is how big is Pluto? And the only correct answer at this point is: we don't know, precisely. What about the June 23rd and June 27th (2011) Occultations of Pluto and Charon in the first and pluto and hydra in the second? Can you give us any updates as to how many chords were sucessfully obtained in either ot boyh of this events?